Saving For Your Future » Investing » evestor Review – is this the best robo-adviser in the UK? Robo-advisers and wealth management services are an increasingly popular and fast way to have your money managed and monitored online without the high fees of traditional financial advice. Nutmeg may be the market leader in the UK, with over £1billion of assets under management, but there are a host of other robo-advice services that are capturing market share. These include Moneyfarm, Wealthsimple and Wealthify. Evestor is another new entrant, launched in 2017, offering three portfolios investing in passive funds based on an investor's risk appetite. In this evestor review, I see how it stacks up against the competition. Evestor is a robo-advice and portfolio management service aimed at investors of all ages and experience, letting users build an ISA, pension or investment portfolio from as little as £1 based on their individual investment profile. Evestor has some big financial industry names behind it. One of its founders is Duncan Cameron. He knows all about disruptive businesses having launched comparison website MoneySupermarket back in 2003. His business partner is Anthony Morrow, founding shareholder of financial advisory group Paradigm. The biggest problem facing every new robo-adviser is client acquisition. The likes of Wealthsimple, Moneyfarm and even Scalable Capital have launched in the UK after having acquired significant customer and market share overseas. Insurance company AVIVA recently bought a majority stake in Wealthify which will ultimately allow AVIVA to promote Wealthify to its existing extensive client bank. 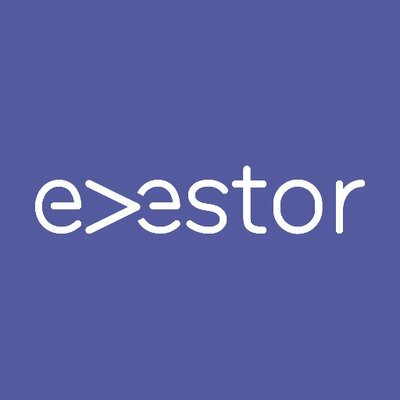 It will be interesting to see how evestor overcomes the customer acquisition issue. Given Moneysuprermaket’s meteoric rise, initially via word-of-mouth, I wouldn’t bet against Duncan Cameron repeating the trick with evestor. The Evestor business is fully regulated and is listed on the Financial Conduct Authority register as a trading name for E-vest Adviser Services. You don’t need a lot of money to start investing with evestor. The evestor minimum investment is just £1 through a direct debit. This makes it accessible to even novice investors. When compared with other robo services it is on par with Wealthsimple which has a minimum investment amount of £1. In contrast, Moneyfarm and Nutmeg’s minimum investment is £500, while Scalable Capital has a £10,000 minimum. There are also no maximum investment limits with evestor but debit card transactions currently require a minimum of £1,000. There are three ways to invest with evestor. The first option is taking financial advice. This is where evestor offers an online advice service that recommends one of three investment portfolios based on your answers to a 15-minute questionnaire (Which in reality takes around 10 minutes). Investors are asked about their financial situation, investment experience and attitude to risk and are then given an instant personal recommendation of which evestor portfolio would suit them best. To all intents and purposes, there is little difference in feel between evestor’s financial advice route and other robo-advice firms' onboarding risk questionnaires. The ‘advice’ aspect comes from evestor recommending which of their three portfolios (and via which tax wrapper i.e. ISA or SIPP) you should invest in. In that regard, it is restricted advice although there is an option to arrange a chat with one of their financial advisers if you need it (You can request a slot online for a callback). Other services such as Wealthsimple and Moneyfarm also offer a similar service. The second option is to choose to have the robo-adviser assess whether it is worth transferring your current savings to the platform, or the third option is to just set up an evestor ISA or pension portfolio without any assistance (called execution-only). Evestor offers three different risk portfolios (covered in more detail later) combining bonds, equities, property and cash using passive index funds from respected brands such as Vanguard, Blackrock and Fidelity. These funds, also known as trackers, tend to be cheaper than active funds as you aren’t paying the salary and research costs of a management team. Essentially your fund is following the performance of a particular stock market. The funds track some of the most well-known benchmarks in their respected markets such as the FTSE All Share Index – the top 600 UK companies by market capitalisation – and the S&P 500. Whichever you choose or are allocated, you can keep track of your portfolio using the evestor app, available on Android and iPhone. It may be a robo-adviser, but there is still a human touch as evestor offers live webchats and you can also book an online appointment to speak with an adviser. What products does evestor offer? Evestor offers a range of account options. You can access tax-free investing with an evestor ISA, or manage your retirement savings using the evestor SIPP (self invested personal pension.) Other robo-adviser's that offer a SIPP are Nutmeg, Wealthsimple and Moneyfarm. There is also just an Evestor Investment Account for those looking for somewhere to simply make their money work harder. In addition to their investments products, evestor have recently launched a free money management app called “Me and My Money”. The idea is that you allow the app to connect to your bank, savings accounts, credit cards, loans and any other investments, meaning you can see it all in one place. While a neat idea, it isn't revolutionary and it is not something that can't already be done via market leading budgeting apps such as Yolt and Emma. You can read our article the best budgeting apps in the UK to find out more. What products will evestor offer in the future? In late 2019, evestor are launching 'Open Money', a new digital app that chief executive Anthony Morrow describes as a 'digital financial advice service'. 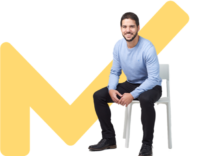 Since they launched in 2017, two thirds of the people that came to evestor for advice were recommended not to invest, so it is clear that their long term strategy is to service the customers who they were previously unable to help. Evestor have partnered with uSwitch with Morrow explaining 'We want to be able to help people make the most out of their money, our partnership with uSwitch will help us ensure that our customers don't overpay on their household bills'. We will be keeping a close eye on developments over the coming months and updating this review regularly. How do they manage their portfolios? 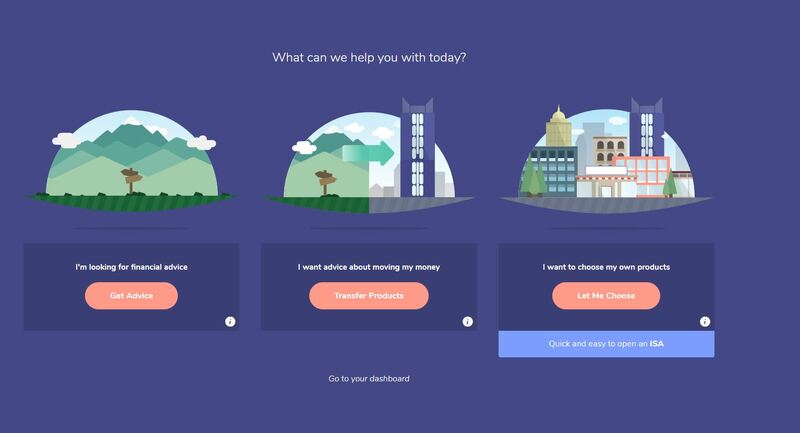 Evestor works in a similar way to how most robo-advisers would deal with a client. They assign a portfolio based on one of three risk profiles and then regularly review how it is performing. The portfolio is not bespoke to any individual and all clients invested in the same portfolio receive the same service and returns. The evestor portfolios are automatically spread across cash, equities and bonds to help reduce the risk and are rebalanced every six months. If you have concerns about the portfolio performance, you can speak to an adviser on the webchat service or book an appointment for a phone conversation. Evestor fees vary depending on the chosen portfolio and are made up of the underlying fund charge and platform servicing fee. The least risky level 1 portfolio has a charge of 0.52%, level 2 charges 0.51% and you will pay 0.50% for level 3. Its rivals have different fee structures depending on the portfolio size. charges 0.75% on funds up to £100,000 and 0.35% on anything above that for its fully managed portfolios. There is also an underlying fund charge of 0.19% plus 0.08% to cover transaction costs. 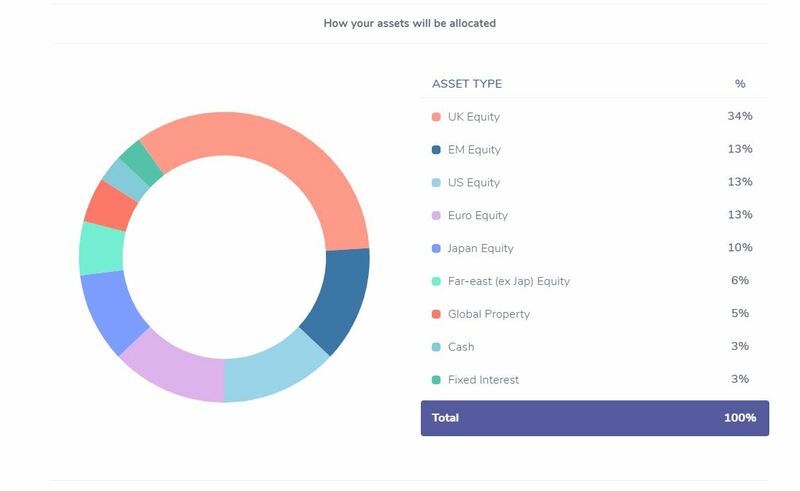 Nutmeg does also offer fixed allocation portfolios where the asset mix never changes which makes them cheaper to run, starting at 0.45% per annum. Moneyfarm typically charges 0.7% for investments worth up to £20,000, 0.6% up to £100,000 and 0.5% to £500,000. Anything above £500,000 is charged at 0.4%. However, I have secured an exclusive offer for MoneytotheMasses.com readers that means Moneyfarm will grant you half price management fees on your ISA for the first 12 months. There is not much data available when it comes to evestor performance as it has been going for less than two years. But the robo-adviser does give an indication of how the portfolios are structured to maximise performance. The least risky level 1 portfolio (below) invests primarily in defensive assets such as cash or bonds, with a small proportion in equities. This is to ensure any losses are limited. More than half, 54% of the portfolio is invested in fixed interest assets, with 22% in cash and the remaining 24% in equities. The level 2 portfolio (below) increases exposure to equities and property to add more risk and a greater capacity for returns. Equities currently make up most of this portfolio at 61%, while 28% is in bonds , 6% in cash and 5% in property. The image below shows the tracker funds that the level 2 portfolio currently invests in. 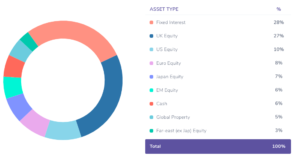 The portfolio's asset mix is broadly in line with that of Moneyfarm’s medium risk profile which has fared well, as discussed in our Moneyfarm review. Level 3 (below) gets more adventurous and is for those comfortable taking more risk for an opportunity to get better returns. There is more exposure to emerging markets, with 89% currently in equities overall. Another 5% is put in global property, 3% in cash and 3% in fixed interest. Something to be aware of however is that the asset mixes are not regularly reviewed. Our original review of evestor, back in 2018 has the same asset mix as our latest 2019 review. Evestor’s closest rivals are Nutmeg and Moneyfarm. All three robo-platforms will ask questions about your income and investment goals as well as how much risk you are prepared to take and will then come up with a recommended portfolio that will be regularly monitored and rebalanced (less so it seems with evestor). In each instance you can be screened-out by the online questionnaires for not being suitable to invest if you have excessive debts or no cash savings. However, you can simply alter your previous answers to the questions in order to get through the screening process which does make the whole thing seem a token gesture. Despite the similarities between the three services there are some differences in where your money will go. Evestor comes up with three portfolios depending on your answers, while Nutmeg has 10 managed portfolio ranging from cautious to aggressive attitudes. These are regularly reviewed depending on market conditions and users will receive regular investment strategy updates and can watch video explanations on Nutmeg’s website. Both will let you open an ISA, SIPP or general investment account. Investors using evestor will have their money allocated to tracker funds, but Nutmeg uses exchange traded funds (ETFs) which tend to be cheaper than tracker funds. Nutmeg has been around for longer than evestor, having launched in 2011, so it has some handy performance data. Its moderate portfolio returned 3.3 % annually in the five years to February 2019, slightly below the 3.6% other wealth managers have achieved. Read our full Nutmeg review for the full lowdown on how its performance and charges compare to other robo-advisers. Moneyfarm assesses investors as low, medium and high risk depending on their answers to certain questions. Their funds are then split across 12 portfolios investing in ETFs, based on risk and the amount invested. It offers a general investment account, ISA and also a SIPP. Moneyfarm’s mid-range level four portfolio has returned 7.2% annually on average for those investing under £50,000 and 6.1% for those above. Read our full Moneyfarm review for more details, especially on their favourable performance and charges vs their peers. When signing up to evestor you first need to enter your email and will then be sent a registration link that will take you to the slick-looking evestor portal. This is where you will need to fill in your name and date of birth and create a password. You can then access your online dashboard, where you can view your account performance, documents and messages and book appointments with a financial adviser. There is a “Let’s get Started” link which will take you to three options, as shown below. These let you select getting advice, assessing your current pension or ISA for a transfer or just simply going straight into choosing one of its portfolios. If you choose the advice route, you will need to complete a 15-minute questionnaire that assesses your goals, income, risk profile and capacity for loss and comes up with an instant personal recommendation from its three portfolios. There are useful calculators so you can work out your income and expenditure and it will even say if it thinks you would be better off staying in cash and not investing for now. Those choosing the transfer option will need to complete a letter of authority to let evestor contact their current providers to analyse the products and recommend whether it is worth moving. If you have already decided you want to set up an evestor account, you can select the “let me choose” option and will be referred to a page where you can set up an evestor ISA, pension or general investment account. You can book a phone appointment to discuss any concerns about your portfolio. However, it has chosen to only provide investments through passive funds. If you are a fan of active management then this may not work for you. It’s worth remembering that a robo-adviser only provides investment advice, whereas an IFA will also offer wider financial planning that would also link your other needs such as insurance. Evestor is regulated like any financial adviser or provider. Your savings are held by a third-party platform provider in a separate client money bank account. This protects you from evestor being able to access and run off with your money before it is invested. Any cash held in a client money account before it is invested is covered by the Financial Services Compensation Scheme (FSCS). This means you would get up to £85,000 of your savings back if the client money account provider went bust while holding your cash. Once invested, if evestor goes bust, you will get FSCS protection on up to £50,000 of your money. This does not protect you against poor stock market performance though. Evestor offers a simple-to-use and cost-effective investment service with handy advice on-hand. The platform also goes a bit further than others by offering an advice service and looks at whether it is worth transferring your current savings. This additional bit of hand-holding will win some fans but its lack of investment performance data means that the likes of Moneyfarm and Nutmeg will prove a draw to potential evestor customers. For the time being the evestor SIPP product sets it apart as one of the few robo-advice pensions available in the market alongside the likes of Nutmeg, Moneyfarm and Wealthsimple. With evestor launching 'Open Money' later this year with a focus on helping those that are not able to invest, I do question how much love will be given to those that already invest or those that are willing to. Time will tell I'm sure and we'll update this review as we learn more. There is a big market for robo-advisers and you should take a look at all services to see which type is best for you. We have already mentioned Nutmeg, Moneyfarm and Scalable Capital. But you could also try Wealthsimple, which builds portfolios of trackers and has no minimum investment. It charges 0.7% up to £100,000 and 0.5% above that, this is known as their black package and comes with additional perks such as investment planning and VIP airport lounge access. It also offers to manage the first £10,000 for free in the first year. You can create an ISA, Junior ISA, SIPP or general investment account. Alternatively, Wealthify charges start at 0.7% for account sizes from £1, 0.6% on those above £15,000, 0.5% for over £50,000 and 0.4% for portfolios worth £100,000 and above. It builds a passive portfolio mixing ETFs and tracker funds across five investment styles based on an investor’s risk attitude.